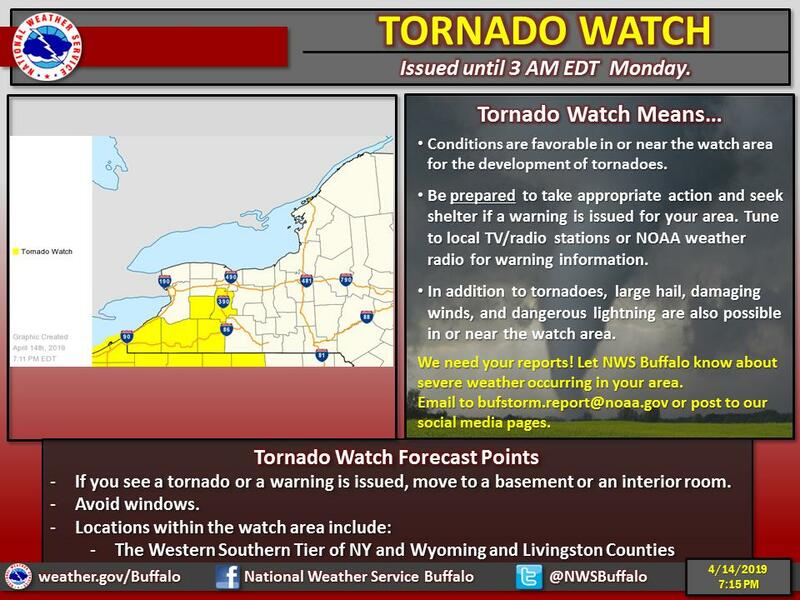 The National Weather Service has canceled its tornado watch for all eight Western New York counties, but it remains in effect until 5 a.m. for the Finger Lakes and most of Central New York. The fierce storm, accompanied by strong winds, heavy rain, hail and lightning, had its greatest impact in northeastern Cattaraugus County, where National Grid reported nearly 5,900 customers without power on its website at midnight. Service was expected to be restored Monday morning. Most heavily affected were Delevan, Machias, Lime Lake, Freedom and Franklinville. NYSEG said on its website that about 100 of its customers in the Springville area also lost electrical service. A line of severe thunderstorms swept into the area from the west about 8 p.m., prompting warnings for Chautauqua County, Cattaraugus County and the southern half of Erie County. As the storm moved eastward, other warnings were posted for Allegany County, Wyoming County and Livingston County.